It is increasingly argued that bargaining between citizens and governments over tax collection can provide a foundation for the development of responsive and accountable governance in developing countries. However, while intuitively attractive, surprisingly little research has captured the reality and complexity of this relationship in practice. This book provides the most complete treatment of the connections between taxation and accountability in developing countries, providing both new evidence and an invaluable starting point for future research. 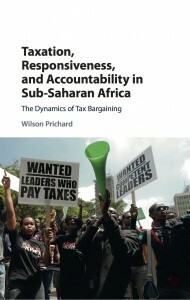 Drawing on cross-country econometric evidence and detailed case studies from Ghana, Kenya and Ethiopia, Wilson Prichard shows that reliance on taxation has, in fact, increased responsiveness and accountability by expanding the political power wielded by taxpayers. Critically, however, processes of tax bargaining have been highly varied, frequently long term and contextually contingent. Capturing this diversity provides novel insight into politics in developing countries and how tax reform can be designed to encourage broader governance gains.